I love turquoise. Can I say that again…..I love turquoise. 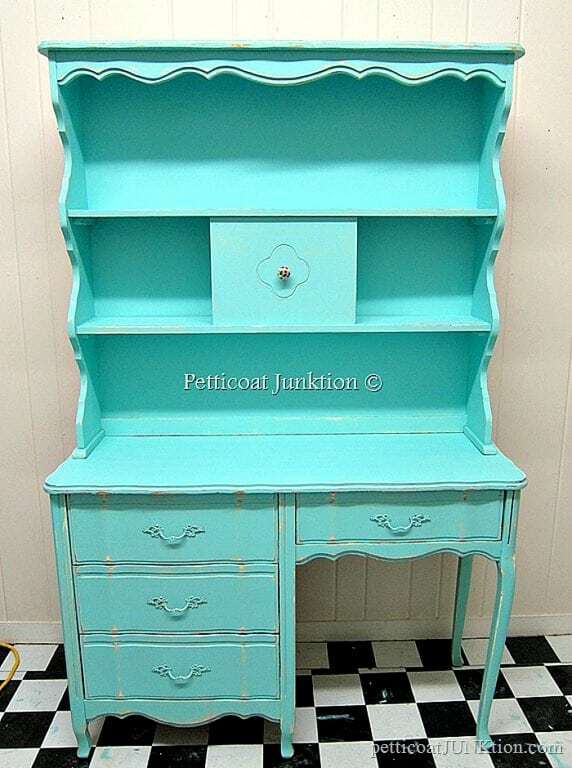 I have several turquoise furniture makeovers in my past. The color seems to be making a comeback or maybe it never left. Turquoise just screams happiness. It brightens rooms, it draws in the eye, and it makes me do the happy dance. If you have a piece of furniture that no longer fits in your home or your décor you can get rid of it or you can give it a new life. It’s usually cheaper to give it a new life than go out and buy something new. I’m all about saving money so I would opt for working with it and see what happens. It’s hard to imagine the end transformation in your mind until the project is started. You will be amazed how one coat of paint will get you pumped up and impatient to finish the project. If you’ve ready to take the plunge I have a bunch of turquoise furniture makeovers for inspiration. Three of the projects are mine from earlier times. I’ve painted a lot of turquoise pieces and you may not have seen these. 1. French Provincial Desk and Hutch. This piece is the picture at the top of the post. The project was a custom job for a lovely young lady. She loved the makeover. 2. Eulalie’s Sky Side Tables. I love these two tables that started life as part of a vanity. The turquoisy color of Eulalie’s sky is perfect too. 3. Turquoise Table Top and Blonde Bottom. It hasn’t been that long ago since I painted this table and I think the makeover made my Aunt smile. My Aunt and Uncle purchased this table soon after they were married. The top got a little damage over the years and needed something. I’m glad I was able to just pretty up the top and leave the blond finish on the bottom. 4. Buffet Entertainment Center Makeover. If your TV stand is dull and boring it might be time to try something new. This buffet turned entertainment center has hidden compartments for all those electronics. 5. Barstool Makeover. Adding a fun pop of color to your kitchen barstools is a great idea to create a funky and fun focal piece to your dining area. The great thing about DIY projects is that they don’t have to be massive undertakings to make a huge difference! 6. Turquoise Dry Brushed Nightstand. Painting over furniture is a super simple way to make it look new again. If you have a piece of furniture that is still sturdy and strong, give it a couple of coats of paint to make it look nice and pretty again! Sometimes, DIY projects are just that simple! 7. Turquoise Painted Dresser Makeover. 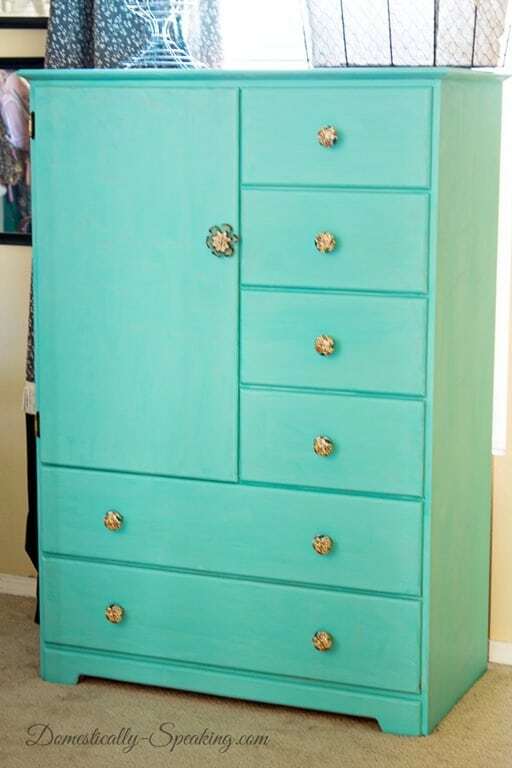 This DIY project is super fun because not only did the dresser get an awesome pop of turquoise color, it also got new knobs. Sometimes you can update a piece of furniture just by changing the hardware, no painting required. 8. Shabby Chic Table Re-Do. Have you ever been gifted a piece of furniture but didn’t know exactly what to do with it? Well…why not do whatever you want to with it? This awesome re-do did just that and the look is gorgeous! 9. Colorful Farmhouse Kitchen Table Flip. The great thing about using the color turquoise is that it can stand alone with other pieces of furniture. This kitchen table didn’t get painted but the chairs did. The contrast creates a bold and beautiful statement that is simple to recreate! 10. Coastal Turquoise Night Stand Makeover. These nightstands are gorgeous after the makeover! The beautiful thing about the color turquoise is that it can be different shades making each piece that is painted have such a different look. 11. Turquoise Dining Table. Needing to find a way to give your dining room and table a quick pop of color? This is the DIY project that you’ve been looking for! 12. Mirror Makeover. Even mirrors can have updates done to them! Give this simple DIY project a try to give your mirror a much-needed facelift! I consider this mirror a piece of furniture because it is a stand alone mirror. 13. 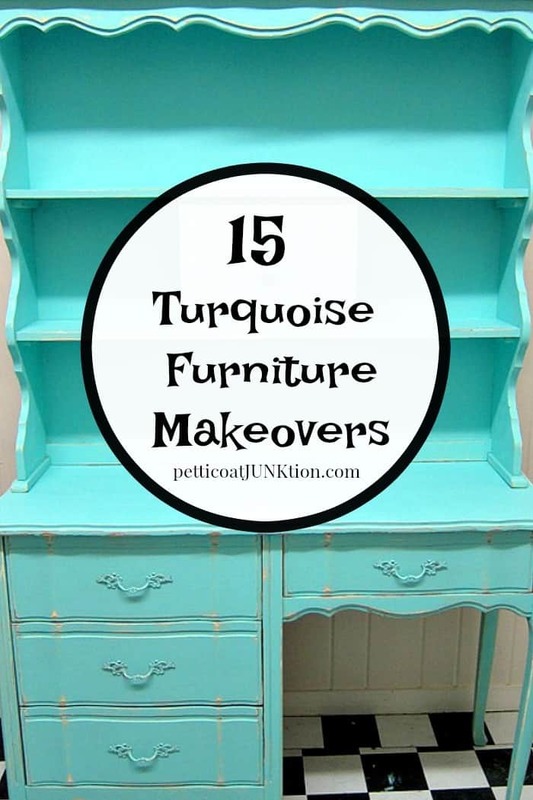 Turquoise Furniture Makeover. If you have a large dresser or cabinet that you’ve been wanting to tackle, this is the makeover for you. 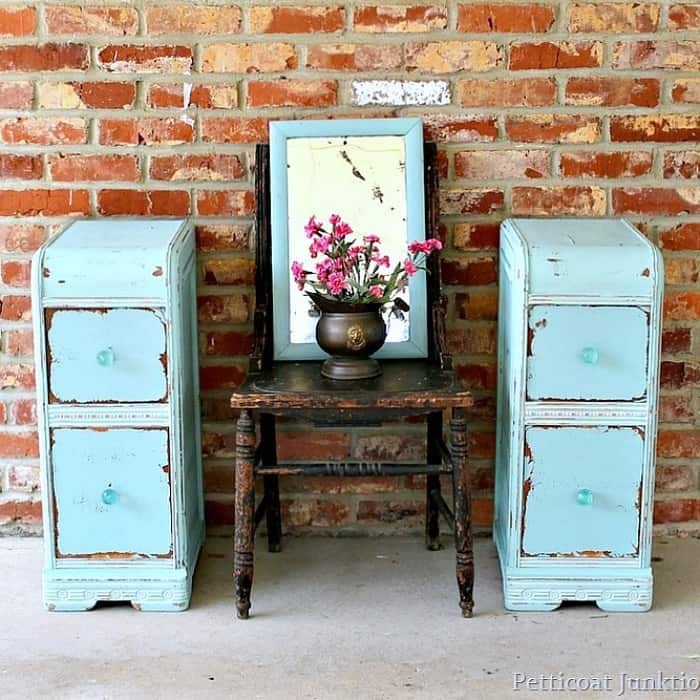 Take it slow and follow the steps and before long, you’ll have a stunning “new” piece of turquoise furniture. 14. Turquoise Chalk Paint and Gold Metallic Makeover. This metallic makeover shows you can pair other colors with turquoise and create a stunning look that will have you smiling. 15. Turquoise Chalkboard Table Paint. Looking for a great way to update your child’s table and chairs? It’s right here. Furniture paint projects aren’t hard and they’re not all that time consuming. The awesome thing about these paint projects is that anyone can do them! You don’t have to be an expert to be able to create a special piece of furniture for your home. All it takes a little bit of time (usually) and a bit of creativity to bring that old outdated piece back to life. Don’t doubt yourself. I know you can do it. Choose a piece of furniture and get started! You’ll be amazed at your final product! And be sure and come back and tell me about it. 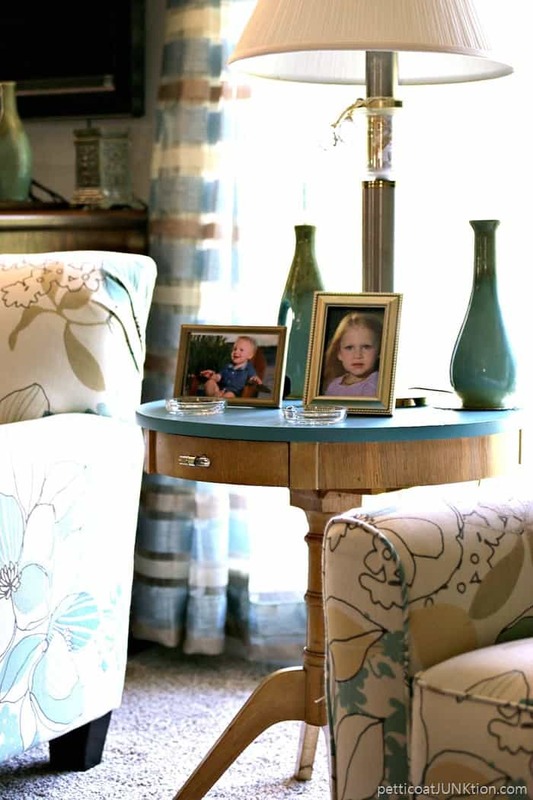 I love turquoise, and your furniture looks great!!! It is inspiring me to paint an old table that is in my formal dining room that needs to be updated. Thank you, Kathy, for all of your inspiration!!! I am liking turquoise quite a bit lately, but only in small doses so far. A vase or lamp here, a pillow there or the turquoise parts in the pattern of my LR rug. It’s definitely an accent color for me at this point, but you never know how that might change in the future! Even so, I always love seeing all your projects, turquoise or not! I do believe I love turquoise now! Not a fan of turquoise, especially that much in one place. The biggest I can take is a small square, sorry.